C3: 4 Modern Temps: Accelerating, Dangerous or Not? HadCrut 4.6, the gold-standard global temperature dataset, confirms that Trump's energy and climate policies are delivering dramatic results the benefit of mankind! After global warming temperature trends hit a post-1950 peak under the Obama administration, Trump has dropped the Obama's scary warming peak to a cooling status for the last 5 years. Yes, temperatures have now decelerated to a rate of a cooling climate. Obama couldn't lower the seas as promised but Trump lowered the world's fever of ever increasing temperatures. Climate Change Apocalypse Cult: Does Empirical Evidence Support AOC's Doomsday In 12 Years Prediction? Does AOC's (Alexandria Ocasio-Cortez) well publicized and dramatic prediction that climate-doomsday will strike humanity in a very short 12 years have any empirical validity? If indeed that is the case, then surely global warming must be accelerating at a fevered rate that should easily be detected within today's known empirical measurement evidence, or not. Per the CAGW hypothesis, the coming climate collapse prediction demands that the rapid global warming acceleration be closely linked with the undisputed continuous growth of atmospheric CO2 levels. But does the empirical evidence support such a link? The adjacent chart plots the global warming acceleration per century rates (12 month, 36 month, 60 month, and 120 month) using the HadCrut global temperature dataset through February 2019. In addition, the levels of atmospheric CO2 are plotted. The temperature plots show a wide range of acceleration/deceleration, especially for the shorter time frames. Viewing the chart (click on to enlarge), it becomes obvious that a major 12-month acceleration trend can turn quickly into a major deceleration trend - a 40 degree +/- change in direction is not uncommon. Currently, both the 36-month (bright red) and 60-month (bright green) are exhibiting a cooling rate (respectively, a -5.9°C cooling/century rate and a -2.1°C cooling per century rate). The 120-month acceleration rate is falling but still in warming mode at +2.6°C/century; and the 12-month acceleration rate of 10.9°C warming rate/century has reversed its trend from a -31.8°C cooling rate reached in December 2017. Putting the current 120-month (i.e. 10-year) acceleration rate in context, as recently as October 2013 there existed a deceleration period - i.e. a minus cooling rate trend. In addition, the February 2019 rate is significantly below the highest warming peaks of November 1983, September 1988, and September 2002; and it is below the pre-1950's peaks of 1941 and 1916. The good news is that there is no indication in the chart's plots that anything extraordinary is now taking place suggesting there is a total climate system of "rapid" accelerated warming. There is nothing there that would provide a reasonable rational basis for any fear of climate change destruction in 12 years. Since the actual current trends do not support the AOC climate change doomsday claim, is there at least any empirical evidence that establishes a strong link between atmospheric CO2 levels and rapid acceleration of warming trends? The correlations between the CO2 levels and the rate of temperature increase is close to being nonexistent. For the 12-month rate the r2 is +0.0006; the 36-month r2 is +0.008; the 60-month rate r2 is +0.04; and the 120-month r2 is +0.14. With such low r2's, the claim that CO2 levels are a dominant forcing which determine the rate of increase in global warming is a hypothesis without empirical clothing. And puts into serious question the validity of the overall CAGW hypothesis. Conclusion: Based on an analysis of the gold-standard global temperature dataset and current atmospheric CO2 levels, there is conclusive evidence that acceleration/deceleration rates of temperature are within a natural variation range, with little to any apparent relationship or enhancement from greenhouse gases, such as CO2. Doomsday from CO2 greenhouse emissions within 12 years is beyond unlikely. The mainstream journalists have been reporting over the last 20 years that global warming was dangerously accelerating due to greenhouse gas emissions, primarily CO2. They reported that this rapid temperature elevation would bring untold climate change disaster and calamity to humanity - per the climate model based speculations - if we did not cease using the fossil fuels that produced the CO2. Yet, despite growing emissions that now surpass 400 ppm in the atmosphere, at the end of 2018, according to HadCrut annual global temperature dataset, the globe warmed by a measly +0.056°C since 1998 - not even a tenth of a degree over 20 years. If that 20-year amount of "warming" is repeated every 20 years, then by the end of 100 years, global warming would have increased a barely measurable +0.3°C degree. This is not your AOC's warming that will end the world in a short 12 years. In addition, the last 20 years of actual warming does not match well with the predicted warming from the most sophisticated climate models' compilation. For the 20 years ending 2018, the models' approximate mean estimate of global warming is +0.50°C . Thus, the expert predicted warming is roughly 8 times greater than actual. All of the above tells one that actual warming has not been either extreme or dangerous. This has been literally worry-free warming over the last 2 decades notwithstanding the climate model scenarios of excessive near-death-warming that must be upon us. SUMMARY: There exists no empirical evidence, nor research studies based on actual empirical evidence, indicating that humanity is being threatened by disastrous warming or associated climate change manifestations. On the contrary, real world indications are that natural climate changes do occur but they do not amount to the claimed existential menace, even with the increase of atmospheric greenhouse gases. These facts confirm that proposed billions to trillions of American's dollars should not be spent on unproven and highly controversial attempts to fix what amounts to non-threatening global "warming" and mild climate "change." A few days ago, we discussed Japan's cooling winter temperature trend and now it's Germany's turn. If Italy also develops a similar cooling trend, it will be the new #ClimateChange Axis, so to speak. As usual, we are beating a dead horse - climate expert predictions that are based on the trace gas CO2 are worthless. No climate or energy policy should ever be based on computer models that are focused on human emission of carbon dioxide. These models cannot simulate natural climate cycle variation at all and thus make for incredibly lousy prediction outputs. Just another case of those stubborn facts getting in the way of pseudo science by simulation. Does Empirical Evidence Debunk The Runaway Global Warming Consensus? The consensus regarding the catastrophic global warming hypothesis is completely reliant on a proposed positive feedback producing runaway global warming that will destroy human civilization. Simply, is it happening? To answer that question, one can examine the HadCRUT4 (HC4) empirical climate surface temperature record in order to identify if a positive feedback is evident. As done with a previous article involving the analysis of the satellite record of temperature acceleration warming trends, the same can be accomplished with the HC4 global dataset. Thus, this analysis will also focus on both short and long-term warming trends to determine whether a constant state of acceleration is present. First, the chart on the right represents satellite short and long-term acceleration plots used in the prior article; the chart of the left plots the short and long-term warming per century acceleration rates derived from the HC4 land/sea global dataset. To attain the best apple-to-apple comparison, both charts are based on a start date that coincides with the advent of the satellite measuring technology in 1979 and through month-end February 2018. Visually, the chart similarities of the two different temperature measuring methodologies are striking. When scrutinized closely, there are differences, but those would be expected when one methodology is measuring lower atmosphere temps and the other methodology is based on near-surface temps of land and water. As found in the prior analysis of the lower atmosphere temperature record, global surface temperatures accelerate at a faster pace and then always decelerate to a slower pace that may even indicate the potential of a cooling climate regimen. More importantly, the HC4 temperature dataset verifies what the prior article on the satellite dataset established: despite multiple major warming El Nino events, and with over 60% of all 1850-2016 total CO2 emissions being released since 1979, there is absolutely zero indication of a positive feedback's existence producing a runaway, "tipping point" warming acceleration. On the contrary, as of February 2018, all 3 short-term temperature HC4 acceleration trends at the end of February 2018 are well below their respective beginning trend values; and the ending February 2018 long-term per century trend is practically the same as the beginning trend value. This finding matches with what was identified in the previous satellite analysis. Additionally, as noted at the bottom of each chart, the positive correlations between the rolling monthly temperature trends and the cumulative growth of CO2 levels (ppm) are empirically not much different from zero; plus, both the long-term satellite and surface global trends seemingly have an inverse relationship with accumulating CO2 gases (a possible explanation?). If correlation is an indicator of potential causation, then one would need to look at an entirely different reason other than CO2 emissions for any attempt to justify a belief in the runaway global warming scenario. Since a dangerous accelerating climate warming simply does not exist after decades of vast amounts of human greenhouse emissions being released, it is fair to conclude that the consensus of a catastrophic runaway global warming is debunked and entirely without any empirical merit or validity. It still remains mere speculation after all these years, and should possibly be considered another candidate for the ash heap of group-think "consensus science." Note: Excel used to calculate trends and to plot. HC4 dataset. The satellite dataset is 50/50 weighting of the RSS and UAH datasets. Monthly CO2 dataset. Calculated trends do not predict the future trends. One of the major tenets of the anthropogenic hypothesis of global warming is that the number of extremely hot days would increase, potentially causing catastrophic loss of life. Such occurrences are the expected climate change manifestations from increasing CO2 emissions predicted by consensus experts and climate models. But do these manifestations occur currently in a non-urban area with greater frequency than in years prior to modern global warming fears? If CO2-driven global warming and climate change are as truly powerful and to be feared as many suggest, then the evidence of a greater frequency in the number of extreme hot days should be obvious. As in many countries, Japan uses the 30°C (86°F) minimum to designate an extreme 'hot day'. The adjacent chart for the island identifies the number of 'hot and furious' periods going back to 1926 based on the 30°C criteria. For the 21st century specifically, including year 2000, there has been an average of 22.7 extreme hot days per year through 2017. That's pretty high, especially when compared to the 1970's. But is that 22.7 number for the last 18 years unprecedented? Turns out the answer is 'no'. The following 18-year periods, including 1929-1946, 1930-1947, 1931-1948, 1932-1949, 1933-1950, 1934-1951, 1935-1952, 1936-1953, 1937-1954, 1938-1955, 1939-1956, 1940-1957, 1941-1958, 1942-1959, 1943-1960, 1944-1961, and 1945-1962, had a higher average of hot days versus the 18-year period ending in 2017. The 18-year span ending in 1958 had the absolute highest average count of extreme hot days - 25.8 days - per year. What one can hypothesize from the above data and chart is that the huge growth of CO2 emissions has not produced the greater frequency of extreme hot days expected by experts. And also surmise that natural climate processes, for both the past and the present, are the responsible driver for periods with extreme hot weather events. It should be noted that the modern count of extreme hot-day years has also been shown to be less in the modern U.S. era of high CO2 emissions when compared to the past. This actual empirical evidence does refute the expert prediction that the frequency of extremely hot days across the globe would be a direct result of higher atmospheric CO2 levels. And although there certainly may well be regional areas of the world that have experienced a greater frequency - especially concrete/steel highly urbanized areas - there are indeed other areas of the world that have not. Note: This Japanese blogger compiled the data and produced the chart. Per our prior article, an examination of the empirical evidence for atmospheric warming was done to determine if Earth had crossed the 'tipping point' red line. This article drills down further to look at specific data points. The adjacent chart - using the same information as before - narrows the focus down to a few specific markers of both short-term and long-term global warming acceleration. On the chart, the 12-month first and last calculated trend points are marked as red dots; for the 24-month first and last, the representation marks are the blue dots; and for the 36-month first and last, those are designated by the two bright green circles. Clearly, despite the substantial increase of atmospheric CO2 levels from 1979 to 2018, all the ending acceleration trend points of February 2018 are actually lower than the very first trend points for each short-term period. The chart's aqua colored trend line is constructed using the 240-month rolling calculated trends (the count of calculated trend points making up the aqua line is 231). The aqua colored triangles mark the first, last, and highest calculated warming trend points. For the long-term, the empirical evidence confirms that the February 2018 acceleration trend of 1.17°C per century is lower than both the beginning trend value of 1.74°C and the highest trend value reached way back in April 2004 of 2.52°C per century. One could surmise that this result is climate evidence of a long-term atmospheric negative feedback mechanism in play. Conclusion: For a tipping point and/or runaway warming to be reached, and then survive, the anthropogenic global warming hypothesis demands that the lower troposphere warms in a consistent and accelerating mode, due to the hypothetical positive atmospheric feedbacks supposedly produced from fossil fuel CO2 emissions. As this analysis substantiates what the prior article had found, the current climate "tipping point" claims and/or concerns are completely without empirical evidence merit or, if you prefer, categorically factless. Additional global, regional, and historical temperature charts. Note: This analysis of the empirical data from January 1979 through 2018 is about the past, and it should not be interpreted as a future prediction of climate change/response. Excel was used to calculate and plot the multiple rolling/moving LT temperature trends and monthly CO2 cumulative totals. Tipping Point Revisited: Are Global Warming Temps Accelerating To The Point of No-Return? Every time there is a "hottest" day, a "warmest-than-ever" month, or an extended period of quickly rising global temps, there are many who instantly claim that the world has reached a runaway climate change condition, or a global warming tipping point, or a soon to be doomsday, a no-return cascade turning Earth into the next Venus. The adjacent graph is one that we have produced in the past. Every few months it is updated in the quest of finally identifying the no-return doomsday tipping point that so many celebrities, journalists, and politicians fear and speak of. The graph contains simple plots exhibiting the constant linear growth of cumulative CO2 levels in the atmosphere and multiple temperature trends. The per century trends plotted are derived from the gold-standard NASA satellite atmospheric - i.e., lower troposphere (LT) - temperature measurements. The measurements are produced by two organizations - RSS and UAH - and the graph's trend plots represent a 50/50 average of those RSS/UAH published datasets since 1979. As the plots make abundantly clear, since the inception of satellite measurements, LT short-term temperature trends go up and then they go down. The LT temperatures regularly have an acceleration spike and then a subsequent deceleration spike follows. These acceleration and deceleration trends obviously follow some sort of cyclical pattern that are completely divorced from the incessant growth of atmospheric CO2 and/or other human-based activities. Those are the stubborn facts, with the end result being that nature totally trumps human influence in regards to climate. Conclusion? And the "tipping point" remains nothing more than factless hyperbole. The opinions on climate change from analysts, researchers, and academics continue to change as the evidence of global warming - or lack thereof - is presented. This recent article reminds readers that global warming is not a 'global' phenomenon since many areas of the world exhibit cooling, as the adjacent image reveals. Then there is this recent article that refers to a published peer-reviewed study by a group of climate scientists who have found the current land-based temperature measurement capabilities to be less than stellar and even unsatisfactory in many cases. The scientists go on to suggest an alternative measuring methodology being deployed globally that the U.S. has already developed. Finally, there is this recent article indicating the forever changing "settled science" in regards to the predicted influence of CO2 on global warming. As the evidence grows that global warming has not been as great, nor as fast, as the climate models predicted, the experts (and the IPCC) have been continually forced to reduce their estimates of climate sensitivity to CO2. Conclusion? Much to the dismay of many, the actual "global warming" is having a significant impact on science in a way they did not want. It's just another case of those stubborn facts that so often plague the elites. Or, to put it another way: climate doomsday is delayed for another millennium. Satellites, the advanced gold-standard technology that humanity has used to explore the moons, the planets, the solar system and beyond, are also widely deployed to explore Earth and its atmosphere. A key empirical satellite measurement that especially interests the scientific community is the global warming of the lower troposphere (LT) . This empirical evidence is critical to determine if catastrophic global warming beliefs are rational and deserving a response. The widely held global warming belief is that human Co2 greenhouse gases will soon cause, via a positive feedback loop, a rapid tipping point warming of the lower atmosphere, resulting in a destruction of Earth's surface and an eventual decimation of civilization. Many who believe in this catastrophic global warming scenario even speak of the potential of Earth becoming another uninhabitable Venus. As it turns out, satellites are situated perfectly to be the premier 24/7 monitoring system of the atmosphere, thus allowing scientists to measure and watch for a constant warming acceleration - i.e., indicating the existence of the hypothetical tipping point. Over the last 3 full years, the satellites have measured a lower atmosphere (aka LT) temperature that has exceeded past temperatures of the previous 36 years. The same 3-year warmest temperature phenomenon has also been experienced on Earth's surface. In the case of the lower atmosphere, the temperature rise has been about a half-degree Celsius - that's during almost 4 decades of satellite measurements. The increase possibly has raised the absolute lower atmosphere temps to about -4.0°C, which is still significantly below zero. Conclusion #1: The absolute temperature of the lower atmosphere has not been raised significantly despite multiple decades of human Co2 emissions. The current level of LT temperatures are not likely in the least to produce an imminent global warming catastrophe, nor a feared "tipping point." The included chart plots both the temperature anomalies (column plots) over the last 3 warm years and the moving 36-month (3-year) per century warming/cooling rate of the LT. The global warming catastrophe premise requires that trace Co2 gases produce a positive feedback loop that creates the rapid and runaway tipping point of accelerating temperature increase. Yet, despite the last three years being the warmest in terms of satellite measurements, the plot of the rate of global warming per century has collapsed over the last three years. Instead of the proposed positive feedback producing ever faster atmospheric temperature increases, the plot reveals a very strong warming trend that accelerated during the 2015/16 El Nino phenomenon, which then quickly decelerated to a per century trend of 4.3 degrees Celsius - and, in the recent past, similar deceleration patterns have lead to outright negative per century cooling trends. Conclusion #2: There is absolutely zero empirical evidence from the most advanced and sophisticated scientific technology available that Co2 emissions produce a constant positive atmospheric feedback leading to an ever faster acceleration of global warming. The familiar strong acceleration and then strong deceleration repeating pattern is representative of natural climate variation, not of a human-induced runaway overheating of the climate. Conclusion #3: Since Conclusions #1 and #2 are derived from the actual empirical science evidence, policymakers at the national, state, and local levels have no rational basis to make large expenditures and impose unnecessary regulations in an attempt to stop what has now become a fact-less, irrational, anti-science belief of human-caused catastrophic global warming and climate change "tipping points." Notes: In the earlier version of this article, the wrong chart was used. The satellite temperature anomalies and 3-year warming trends calculated and plotted using Excel; datasets used to produce monthly anomalies in an equal-weighted combination of two satellite datasets - RSS and UAH. From Dec. 1979 to Dec. 2017, the LT anomaly increase of the combined average dataset was +0.54 degree Celsius. The satellite acceleration/deceleration climate pattern in the past has ranged from a +24.0ºC to a -23.1ºC per century trend for 36-month periods. Observed measurements represent scientific empirical evidence. Climate models are not scientific empirical evidence but instead just formula-based speculative prediction/forecasting tools that are unable to accurately portray future climate conditions. At best, climate models are 'what-if' scenario generators that are not capable of identifying the actual future 'what-if' real-world outcome. Stephen Hawking has gained a less than stellar reputation for predicting doomsday catastrophes multiple times. Seems his non-scientific predictions are classic clickbait catnip for mainstream media publications and net tabloids. Hawking's space alien, robot, and nuclear war prognostications have gotten a lot of play and views. Yet they are essentially just vague fear-mongering memes provided by an individual with a high IQ. And then there is his latest doomsday scenario of human CO2 emission causing global warming so hot that humanity on Earth is wiped out by a Venus-like climate of 250 degrees. Unfortunately for Hawking, the empirical evidence clearly indicates that Earth becoming Venus is such an absurdity that even the fear-mongers at the IPCC won't support this vaporfear. Why is Hawking's Venus prediction so way out there in the twilight zone of black holes? Just look at the adjacent chart. Plotted are the absolute temperatures for the tropical oceans and the atmosphere above the tropical oceans, as of April 2016 (purple columns). If the oceans are going to be boiled-off by Venus atmospheric temperature levels, then we are a very long way from that happening. But what about Earth's temperatures a 100 years from now, due to that "runaway" warming Hawking insinuates that we suffer from? Well, based on the linear trend of temperatures since the satellite measurement age began in 1979, the expected tropical temperatures for April 2116 (yellow columns on chart) will barely budge up - ahem, 250 degrees is not in the cards. Earth's actual experience with Hawking's modern "runaway" warming clearly indicates that we can't get there (250 degrees) from here (25.3°, -4.2°, -24.2°). And by the time the next 100 years passes, humanity will no longer be using fossil fuels as the primary source of energy. Technology will advance far enough during that time to make the issue of runaway warming or climate change tipping points from human greenhouse gas emissions moot historical footnotes. Note: Calculated rolling absolute temps using 12-month averages of anomalies and then adding an average absolute temp to the anomalies. Absolute average temp used for HadSST, 24.4C; absolute average temp for UAH lower troposphere -5.0C; absolute average temp for mid-troposphere, -25.0C. Excel used to calculate averages and plot column chart. Venus surface, lower and mid-troposphere temperatures are vastly hotter than 250 degrees that Hawking alluded to. Recently, multiple outlets chose to report to their readers and viewers that February 2016 temperatures were "astronomical" and "strange." Yet for a few hundred million people living in two of the leading industrial/consumer nations of the world, the February temperatures were definitely not astronomical, nor strange. From the U.S. and UK climate agencies, the above two charts plot the absolute temperature levels for the respective countries over the most recent 20 years, plus the global CO2 levels for February. In the U.S., the February temperature was warm, but not exceptional; and not even the warmest February, especially when put into the context of 5% error bars. In the UK, the populace experienced February temperatures that were rather well below average for the last 20 years. As others have noted, the media frenzy regarding "astronomical" represent just more absurdities from alarmist advocacy by "journalists." Obviously, the two above charts reveal the ludicrous terminology "astronomical" is not really global. Most of any "strange" surface warming likely was generated in regions of the world where there exists an exceptional sparsity of thermometers - in other words, probably the warmest surface regions were based on a given climate agency's strange-simulations. And it would seem that continuously rising CO2 levels have had little influence on February temperatures in these industrialized countries. As the majority of experts agree, any high February 2016 regional surface and atmospheric temperatures were the direct result of a natural weather El Nino phenomenon in the the Pacific. Finally, for those interested in the linear trends for both charts, the U.S. February temperatures are cooling at a robust -15.2°F per century pace; the UK February temps are no slacker as they are cooling at -7.2°C per century rate. Indeed, in the face of huge CO2 emissions, both the UK and the U.S. over the last 20 years exhibit a significant deceleration of temperature change warming. Strange, does the all-powerful CO2 just ignore months starting with 'F'? Additional regional and global temp charts. Note: Source of US and UK absolute February temperatures; source of February CO2 levels. Excel used to plot the line and bar charts and means; built-in Excel chart function for 5% error bars displayed on charts and linear trends calculated. Warning: linear trends should not be interpreted as a prediction(s). Even with the strong surge in global temperatures from the current El Niño and from the surge of 2015 global warming exaggeration and fabrication (here, here and here), there remains the strange case of establishment climate science models failing to meet expected outcomes. The climate model predicted annual temperature changes would follow the bright green curve if greenhouse gases (GHGs) were not curtailed. GHGs include: CO2, methane, nitrous oxide, hydrofluorocarbons, perfluorocarbons, and sulfur hexafluoride - the latter 3 are known as fluorinated greenhouse gases. The orange curve represents the predicted annual temperature changes if the GHG growth rate were reduced over time. The chart's cyan (aqua) curve datapoints are the predicted annual temperature changes if GHGs were curtailed by governmental polices and regulations so that year 2000 and beyond had a net growth rate equal to zero. "We have considered cases ranging from business as usual [BAU], which is scenario A, to draconian emission cuts, scenario C, which would totally eliminate net trace gas growth by year 2000." "We define three trace gas scenarios to provide an indication of how the predicted climate trend depends upon trace gas growth rates. Scenario 'A' [chart's green curve] assumes that growth rates of trace gas emissions typical of the 1970s and 1980s will continue indefinitely; the assumed annual growth averages about 1.5% of current emissions, so the net greenhouse forcing increases exponentially. Scenario 'B' [chart's orange curve] has decreasing trace gas growth rates, such that the annual increase of the greenhouse climate forcing remains approximately constant at the present level. Scenario 'C' [chart's cyan curve] drastically reduces trace gas growth between 1990 and 2000 such that the greenhouse climate forcing ceases to increase after 2000." So.....since NASA's top climate expert's testimony, what has happened with the GHG growth and growth rates? "Global non-CO2 emissions are projected to increase significantly between 2005 and 2030 unless further actions are taken to reduce emissions...total emissions of non-CO2 greenhouse gases have nonetheless increased." In addition, the combination of CO2 fossil fuels emissions and CO2 emissions from deforestation, forest fires and peat burning have grown from 72% of all GHG emissions in 1970 to 76% of all GHG emissions. Regarding fossil fuel CO2 emissions, specifically (CO2 data here): NASA and Hansen's 'BAU' Scenario A was proposed at a time when CO2 emissions were growing: since 1972, the 15 years ending 1987 the world emitted 285 billion tonnes of CO2. This represents a CO2 average growth rate of 2.2% per year for those 15 years prior to Hansen's 1988 testimony. In contrast, for the 15 years ending 2014, the world has emitted a total of 467 billion tonnes - that is growth some 1.6 times greater than Hansen's 'BAU'. This represents a CO2 average growth rate of 2.9% per year for the period since 1999. Without any doubt, both empirically and objectively, NASA's Hansen's projected GHG emissions for 'Scenario A' has easily been exceeded since his testimony in 1988. To state otherwise is a falsehood, categorically. Now, back to the above chart. For the year 2015, NASA's model predictions had temperature change for all 3 scenarios declining. Of course, we now know the exact opposite took place with the sharp increase in 2015 global temps. For what it's worth, the chart also shows the 2016 predictions: there is continuing decline for Scenarios B & C, but a sharp spike up for Scenario A to a record calendar year anomaly level. While global warming alarmists are celebrating 2015 as the "warmest" year ever, the climate model failures clearly point to the absurdity of focusing on peak or trough moments as indicators of informed expertise. Peaks happen and troughs happen, in weather and climate, but pointing to either as scientific proof of computer simulations is not science. Taking that to heart, the accompanying chart has 3-year average plots of highly adjusted observed temperatures from the NASA and UK climate agencies - the 3-year averages remove the focus from peaks/troughs. As can be seen, 3-year averages of the GISS and HC4 datasets depict the last 3-year average increase due to the El Niño conditions, and those questionable man-made factors. Be that as it may, the GISS and HC4 averages still remain closer to the realm of NASA's Scenario C range. As a reminder, the Scenario C predictions are a result of net zero GHG emissions simulated to have started in year 2000, which is yet another galaxy away from reality. 1. At this point, now close to 3 decades after NASA's testimony, one can safely surmise that expert climate models can't predict squat. The climate is a chaotic complex that defies even the most sophisticated and powerful forecasting tools. 2. GHG emissions have far surpassed the 1988 "world-will-soon-end" BAU construct - a construct that many alarmists still believe. Yet the predicted positive feedback from BAU has not occurred and thus runaway global warming is, without question, AWOL. 3. The climate models are still absolutely unable to discern either the amount or rate of global warming/cooling that is due to natural forces. The models were designed to purposefully rely on greenhouse gas forcings as their major causal factor, while diminishing natural climate impacts. It's no wonder that climate models remain on a fail path. 4. Based on the model outputs from 1960 to the present, policymakers and the public would be better served by rejecting the alarmist scenarios A and B; instead, moving forward, base all adaption and mitigation policies on Scenario 'C', which would likely produce better outcomes with superior allocation of scarce resources. The climate models definitely have their important place in the climate researcher's toolbox. They are best suited to advance science's better understanding of our world, but their climate predictions, forecasts and prognostications should never be relied on - they are unreliable and inaccurate. Notes: NASA/GISS 2015 temperature dataset and HC4 2015 dataset. Excel was use to calculate chart's 3-month averages from their respective monthly datasets. The lower troposphere represents that layer of the atmosphere which is predicted to first experience the positive feedback of accelerated warming due to human greenhouse gases. Recently, NOAA and NASA held a global warming presentation, which included various charts, and an unexpected admission that the atmosphere was not as warm as previous El Niño years. An essential general review of the presentation can be found here. The troposphere's lack of achieving the "warmest" year label was confirmed by the NOAA/NASA analysis of the relevant balloon and satellite datasets. And the adjacent chart is a combination from the NOAA/NASA presentation, with one chart being superimposed atop the other. Other than a normal atmospheric response to the latest large El Niño temperature surge, the chart documents the continued lack of dangerous positive feedback warming. Remember Those Thanksgivings When You Were Terrified of Rapid Global Warming? The adjacent chart pretty much makes a turkey mockery of accelerating global warming fears. It's simply not flying happening. While the climate science establishment continues its costly and misallocated efforts against "catastrophic" global warming, the empirical evidence indicates the worlds' elites are pursuing a laughably ludicrous Don Quixote quest against an imaginary climate-evil. Like so many Thanksgivings of the past, those on the 'quest' have piously announced civilization's reaching its 'last chance' point of saving itself from climate doomsday. But all of these Turkeynado Sharknado-like prophecies that the end-is-near have proven to be pure anti-science fiction. At some point, we can hope some sanity returns to the climate science anti-CO2 Quixote brotherhood of warriors. But in the meantime, what does the actual climate science say? Well, this chart is just brutally frank: the fast growth of atmospheric CO2 levels (the black dots) have not exactly been the robust evil foe the elite establishment has fixated on. As the chart depicts, the CO2 impact on either short (red curve) or long-term (pink curve) rapid global temperature acceleration appears to be non-existent versus the "consensus" predictions. And the blue-dash curve reveals the rather turkey-like impact on the 36-month average of absolute global temperatures. Indeed, global temperatures have increased since 1950. But the scientific reality is that the chart confirms a steady global warming that has been taking place since the end of the Little Ice Age (late 1700s) - well before the influx of the giant CO2 emissions from the industrial/consumer era. The chart clearly shows a long history of frequent periods of rapidly increasing temperatures, then to be always followed by a significant deceleration. Examine the chart's most recent period, from December 1996 through October 2015. The periods of both rapid temperature increases and decreases are evident, just as they existed since instrumental recording of temperatures first began. The vast majority of climate analysis based on actual empirical evidence show similar results, whether in a global or regional context. Terrified by global warming doomsday? Not so much anymore, it would seem. Suffice it to say, Americans are no longer impressed by the claims of government and celebrity elites. Fully 97% now reject the unreal turkey-esque predictions of climate change disasters. And the American public is not alone. The global masses join Americans in their low assessment of the elites' unscientific climate calamities. As the public has learned, the empirical evidence supports neither the man-made climate change disaster narrative nor the CO2-reducing solutions proposed, which have been seriously debunked. With all that said, foolish anti-science elites will continue to make preposterous claims and those exaggerated, attic-crazy predictions leading up to the soon to be Paris COP21 climate conference. One last 'chance' - look at the chart, are you still terrified this Thanksgiving? How about that wacky college-aged, censorship-loving, millennial niece gnawing on that turkey wing next to you? Note: Excel used to calculate the 3-year absolute temperature and CO2 level averages; also used to calculate the moving 36-month and 360-month per century acceleration/deceleration trends (Excel slope function) as depicted on chart; the absolute temps calculated using the HadCRUT4 month anomalies and NOAA's monthly global mean temperature estimates; and, the 3-year average beginning value for CO2 was offset to a zero starting place. Temperature sources used: here and here. CO2 sources used: here (March 1958-October 2015) and here (used annual historical levels for each month of the given year, from January 1850 to February 1958). The much embarrassing 'Pause' continues to ignore the predictions of the wrong-way IPCC and government-funded climate "scientists" - you know, the "experts" who have been long predicting end-of-the-world global warming since the late 80's. The adjacent chart reflects poorly on the "consensus" science that unequivocally states the human CO2 emissions must first increase the lower troposphere temperatures in order to warm the Earth. This violation of the sacrosanct climate-agenda physics has become a real hiatus head-scratcher for scientists and journalists making a living off the govt-approved orthodoxy. Despite 'those stubborn facts', the elites - i.e. bureaucrats and politicians - of the U.N. and national governments continue plans to party-in-Paris come late November, without any regard to actual climate reality. The political 'Agenda' and climate COP21 show must go on regardless of inconvenient evidence-based science. Global warming hysteria and fear-mongering, as expressed by the fringe green groups, progressive Democrats and the extremists of the Obama administration, are reaching a peak as November's Paris COP21 climate summit is approaching. But is the hysteria warranted? Over and over again the public hears from UN and national government bureaucrats that global warming is rapidly becoming dangerous and accelerating faster than that experienced in the past due to human CO2 emissions. U.S. politicians of extreme left-wing persuasion seem to be especially enamored with over-the-top climate catastrophic predictions, which makes sense since they propose more taxes and regulations to control Americans and businesses and, of course, to "save-the-world," so they say. Seriously, is the hysteria and draconian proposals to eliminate fossil fuels even close to being warranted? Should President Obama really be proposing that the U.S. follow unproven and potentially reckless energy and economic policies based on climate-cult doomsday prophecies? Well, the adjacent chart provides 12 reasons why Obama's obsession and the hysteria of progressives are plainly absurd. Look close - indeed there are at least 12 previous presidential terms that experienced global warming rates (a.k.a., acceleration) greater than anything experienced over the last 6.5 years of Obama's administration. In fact, the majority of the greatest 5-year acceleration (i.e., the highest warming rates) took place prior to 1950 when CO2 emissions were a fraction of today's levels. The politicos' global warming hysteria appears even more contrived and manipulative when examining acceleration using a moving 6.5 year average for the 5-year acceleration rates. On the chart, the black curve is the 6.5 year moving average since 1860. Simply put, the black curve represents 1,868 datapoints for global warming acceleration, thus comparing Obama's length of term with those occupying the White House prior. Exactly 1,170 of the datapoints exceed the June 2015 datapoint of "rapid" warming that has so panicked this administration. Needless to say, global warming from human CO2 emissions is an exceptional yawner, and is in no sense a current legitimate threat when viewed in the context of recent climate history. That's a climate FactCheck and undeniable. And here's more proof that the current warming rate is unexceptional. Note: Source of HadCRUT global temperature data. Excel was used to calculate 5-year slopes (Excel slope function) for each month; then used to produce moving 6.5 year averages of the 5-year slopes. Using the updated HC4 global anomalies dataset, since 1955 the global temperature trend for intermediate and long-term periods has never exceeded 1.8 degrees per century, let alone the fabled 2.0° mark, as of calculations based on the March 31, 2015 date. As the adjacent graph reveals, the latest 10 year trend since 2005 has dropped to a barely measurable 0.4°/century and the last 18 years (since 1997) is an eyelash higher at 0.67°/century - and by the way, both of these figures are essentially climate-impact insignificant. Why 1997? Well...there has been very little warming since 1997. What warming there has been is robustly below what "expert" climate models projected. Climate scientists typically refer to this unexpected deceleration as the 'hiatus' or 'pause'. Per the chart of empirical evidence, the deceleration of global warming is evident from the fitted trend curve. Sticking with that last 18-year trend as of March 2015, how does the most recent period stack up versus other 18-year periods when the entire HC4 dataset from 1850 is analyzed? Since 1850, there has been 1,983 months of reported temperatures. From those, 1,768 18-year trend datapoints can be calculated. The March 2015 18-year trend datapoint ranks number #875 - so, approximately half of the past datapoints possess a higher 18-year trend. Yet atmospheric CO2 growth since 1964, as represented by the green circles on the graph, has been non-stoppable, blowing well past the hypothetical "safe" 350ppm level to reach the highest modern CO2 level ever. This combination of temperature acceleration datapoints and CO2 measurements clearly demonstrates that CAGW accelerated warming does not exist; and it is unequivocally, irrefutably, undeniably and non-debatable that the world is experiencing a rather tepid, 'luke-warming' environment. Historically, today's temperature trends are entirely within in the realm of what has taken place in the past from natural temperature variation, regardless of CO2 levels. In other words, it is indisputable that the current climate does not suffer from "dangerous" man-made warming. One could say that this infallible empiricism defines the non-religious, scientific climate change reality, so-to-speak. Notes: Interpreting the above chart's blue columns: for example, since 1984 (see yellow box) the last 31 years (see corresponding blue column X-axis label) the warming trend was 1.73C/century, as of the 31-year period ending March 2015. The green circles are simple calendar year atmospheric CO2 measurements - the first (leftmost) circle represents 1964 and the last green circle is 2014. All blue columns representing temperature trends use at least 100 months of temperature measurements for the trend calculations (using less than 100 can produce extreme volatility for calculated trends - the less than 100 datapoint calculations are very interesting but can be quite misleading). Excel was used to calculate the different period trends (using Excel's slope function); Excel's charting function was used to plot the trend datapoints. Those stubborn facts: source of UK MetOffice H4 dataset; source of atmospheric annual CO2 levels. As the U.S. East Coast continues to dig out from another major blizzard, it is a reminder that natural climate forces and patterns have eviscerated the predictions made by by government climate "experts." Their predictions of warmer winters and less snow have not only been incorrect, they have been flat-out spectacularly wrong. While ignorance is bliss for many, it is still is no excuse for the elites of politics and media to continue to spread falsehoods about CO2 causing warming winters. As the above NOAA graphs clearly document, the strong cooling trend for the winter months of December (19 years), January (21 years) and February (20 years) across the U.S. northeast is indisputable. Let's be clear about this: there is no identifiable group of climate-doomsday experts within government-funded circles who predicted twenty years ago that CO2 would cause this cooling trend outcome. And precipitation trends over the same time periods in the Northeast? Well, depending on the month, take your pick, up or down. For any given winter month, one year of cold temperatures could produce a wet or a dry month. It would appear that winter weather is not that predictable from year to year; and obviously, nor are climate conditions some 10, 20 30 or 50 years into the future. Those who have relied on the CO2-induced AGW climate hypothesis have continuously been proven wrong. Yet, the CO2 cult faithful still hold climate doomsday predictions as gospel, regardless of the empirical science. Additional regional temperature and severe weather charts, plus a listing of severe weather events from the past. No matter how many years go by, the trend towards ever worse climate model predictions continues. Case in point: The NASA/Hansen climate model that was used by climate experts to convince the politicians, the media and pubic that the world was at severe risk for massive global warming if greenhouse gas (GHG) emissions were not drastically cut. This model's predictions came to the forefront when NASA's James Hansen provided testimony to the U.S. Senate in 1988. As it was discovered much later, the Hansen testimony was stage-crafted for maximum fear-mongering impact, which should have been the first clue that there was a credibility issue regarding the climate model. Essentially, the NASA model predicted temperatures would follow the bright green curve if GHGs were not curtailed. The cyan (aqua) curve datapoints are the predicted temperatures if GHGs were curtailed. Greenhouse gases have continued their accelerated growth, yet the observed temperatures (the green and pink circles) closely match the cyan curve. Simply, the model's predictions have been spectacularly wrong, worsening by the year. The newly published 2014 IPCC AR5 summary report bemoaned the recent significant growth increase of GHGs. The IPCC established the per year growth, prior to 2000, to be at a 1.3% rate. The IPCC AR5 reports that GHG growth has now jumped to 2.2% per year through 2010 (see more details here). To say that GHGs have exceeded the 'business-as-usual" (BAU) scenario would be an understatement - according to the IPCC AR5, a 70% increase has taken place, on a per year basis. Of course, the BAU scenario was made famous by during that 1988 U.S. Senate hearing. Per Hansen: "We have considered cases ranging from business as usual, which is scenario A, to draconian emission cuts, scenario C, which would totally eliminate net trace gas growth by year 2000." In a peer-reviewed article supporting his testimony, he stated that the 1970s and 1980s had an approximate annual growth average of 1.5% (prior to 1988). This was the paper's BAU 'Scenario A' that he spoke of in his testimony. In his written Senate statement, he included an appendix that verifies the ~1.5% BAU estimate for GHGs, plus a chart that depicted the scenarios A, B and C.
That chart is replicated above, with Scenario 'A' being the green curve; the 'B' scenario is the orange curve; and the cyan curve is the 'C' scenario, which represents the 'draconian' emission cuts Hansen states are required to minimize potential global warming. As stated previously, the IPCC has confirmed the rapid, continuing growth of GHGs since the end of 1999, which per the NASA climate model, should have produced global warming equal to the bright green curve on the chart. Instead, climate reality and natural climatic forces intruded - real world temperatures since 1988 resemble the cyan temperature curve of "draconian" emission cuts that Hansen's testimony implied would necessarily make global warming safe by end of 2014. As it turns out, some 25+ years later at the end of 2014, we currently have achieved that implied 'safe' global warming that the climate modelers and experts predicted would not happen unless there were forced gigantic emission cuts. Objectively, the empirical evidence leads to a couple of reality-based, undeniable and incontrovertible conclusions: policymakers should not rely on the unreliable climate models - they're egregiously wrong and not getting much better; and, climate experts truly do not understand the natural forces dominating the climate system. Additional climate model, greenhouse gas and global temperature charts. Notes: This updated NASA/Hansen chart now uses the current HC4 and GISS V3 datasets, as of 12/31/14. Instead of plotting individual year datapoints for observed temperatures, plotted 3-year (36-month averages ending in December): this reflects an expectation that models can't predict accurately every annual period, but over longer 3-year periods the model and observation trends should better match. Starting in 1960, both GISS and HC4 3-year averages were offset to start at zero (0.0°C) anomaly. To reduce the clutter on chart, only 'even' year observed 3-year temperature datapoints were plotted. The small insert chart is data from IPCC AR5 summary report. The green, orange and cyan Hansen model plots came from this climate-doomsday site. The HadCRUT4 (HC4) global temperature dataset is now considered the gold-standard for surface temperatures (the previous gold-standard was the HC3 dataset). Using the annual HC4 calculated temperatures, the adjoining chart was created. As observed, the global temperatures have essentially stalled since 1998, with 2014 likely not greater than that reached in 1998. This chart also delineates the two major warming periods since 1850. The first from 1917 to 1944; the last from 1976 to 1998. The warming trend increase of the latter over the former was a paltry +0.4 per century - an increase well within what one would expect from natural variability, regardless of CO2 levels. And then there's the CO2 growth itself. The 20-year growth rates show an almost continuous climb since the early 1950's. At the end of 2014, it was the highest ever. This greater than 'business-as-usual' growth was discussed in the latest IPCC AR5 report - the growth rate for total greenhouse gases has followed a similar path. Finally, the chart depicts where the much discussed 2º, 4º and 6º increases over the 1850 global temperature would be... see the red dashed lines. How long to reach the 2º mark that elites fear so much? Well, per the last 18 years, that trend would indicate another 150+ years before the 2 degree increase would ever be reached. From this empirical evidence, it would be fair to surmise that invoking more big government polices and regulations to combat unsubstantiated climate-doomsday speculation might not be in the best interests of the public. Note: Trends of the past are not reliable predictors of future. This is not brain surgery. This is not rocket science. This is not nuclear physics. This is climate science fact versus climate science fiction (i.e. computer model simulations). Climate science fiction: For the last 10 year-period, the UN's IPCC climate models predicted greenhouse global warming equaling a per century trend of 1.7°C. Climate fact: The globe warmed at only a +0.2°C/century trend. In other words, global warming has stalled, paused, or if one prefers, in a hiatus condition. Simply put, the computer simulations programmed by CAGW alarmists produced virtual global warming 8 times greater than climate reality. This spectacular failure by models (developed by the "consensus" experts) is well documented. And as of this date, there are over 50+ excuses reasons by these "experts" as to why their billion-dollar climate simulations have turned out to be worthless for policymakers. Article source for above climate model predictions. As this chart of empirical evidence demonstrates, global warming has taken place in the past, well before the explosion of CO2 and other greenhouse gases. And there have been times when earlier warming either equaled or exceeded modern warming. For the 25-year period shown, early 20th century warming was actually greater than the 25-yr warming through 2014. For almost all consumers of the mainstream press, they are totally unaware that recent warming has no 'chops', so to speak. It is not "unprecedented" and it certainly is less rapid than the earlier period. Also, the modern warming rate exhibits a 1.16°C per century trend. The earlier period? A 1.75°C/century trend. Boiling it down to the numbers...that's 1.5x faster warming for 1920-1944, yet modern CO2 emissions had a growth 5.6x greater. That's the opposite of expert predictions. Accurate and fair to say, modern warming is not exceptional. Regardless of this unequivocal and indisputable scientific empirical evidence, which challenges the "consensus" global warming orthodoxy, the mainstream media chooses to gleefully push the latest discredited propaganda regarding the "hottest year ever" - an event that has been happening since the end of Little Ice Age, with an astoundingly great frequency. Facts rule. The 'PR' exaggerations and embellishments are just anti-science dressed in those old fearmongering clothes. One's got to sell newspapers or web page hits, no? 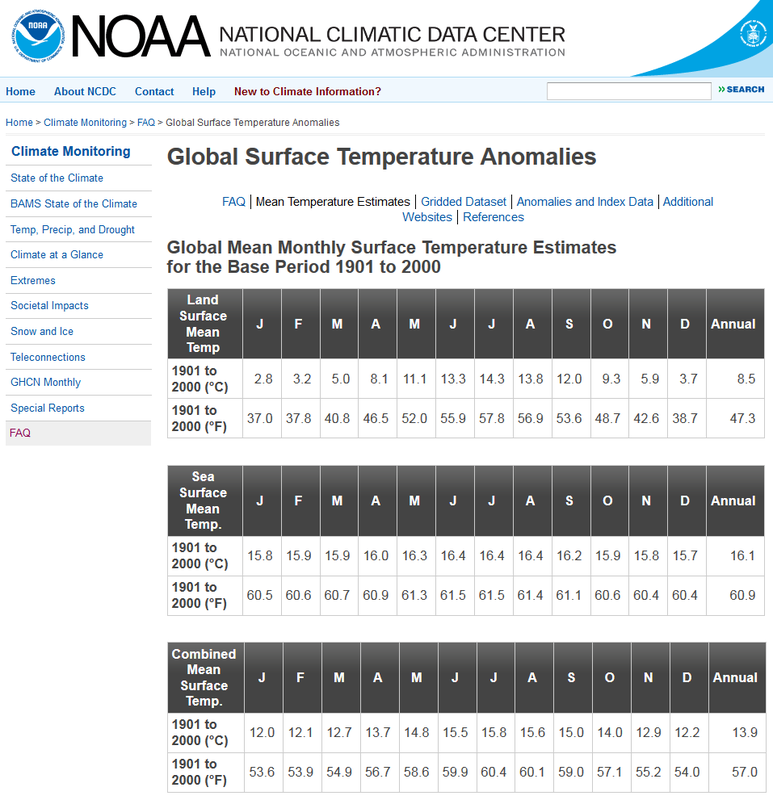 Note: Source for annual NOAA temperatures used in Excel to calculate and plot 25-year temperature changes and linear trends. For the earlier period (1920-1944), 1919 was used as the base year; for the modern era, 1989 was the base year. NASA's climate experts are on record for predicting all sorts of climate catastrophes, including extreme warming of the world's 'higher' latitudes (the world's polar/subpolar regions). Certainly for Antarctica, that prediction was simply a spectacular failure. Now comes information that NASA's "hottest-ever" year/decade has not produced a single hot temperature record in Canada since 1961. With Canadian lands mostly occupying the higher latitudes ('subarctic' starts at 50N), this is remarkable empirical evidence that the predicted extreme climate change is not so extreme. The adjacent table of Canadian hottest temperatures recorded documents that this massive area near the top of the world has not experienced the natural hotter climate that it once had during the 1930s and 40s. The table also includes the last 15 years of Canadian warmest temperatures - not a single year coming close to previous records with the exception of year 2007. Note: Source for Canadian hottest temperatures - just some more of those inconvenient climate stubborn facts.